In the Upper Ordovician Mamuniyat Formation fine and medium sandstones, numerous levels of conglomerate are present. Beds with Tigillites have been observed. 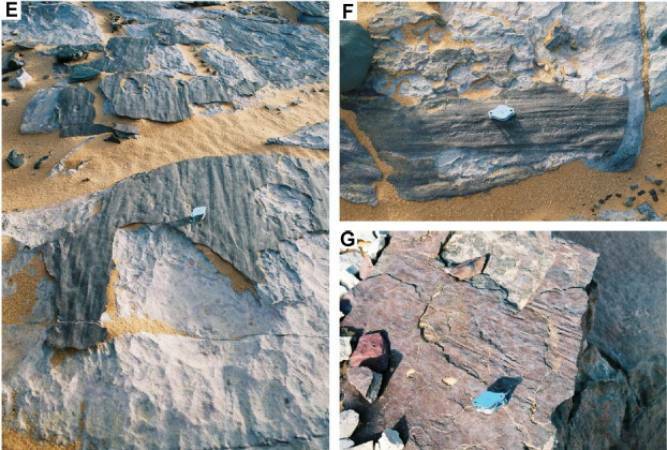 Metamorphic sandstones have been observed at Jabal Qardah (30 km west of Jabal Arkenu). Another small outcrop of metamorphic quartzites, more or less bedded, is located 12 km N of Jabal al Qardah, corresponding with a fault running approximately SE-NW. The age of these metamorphic sandstones is uncertain. To the west of these last two reliefs, some scattered outcrops of the basement -- both metamorphic and granitic -- are overlain by well-layered sandstones which are generally medium and fine grained and reddish on the surface. A level was discovered with frequent Tigillites. 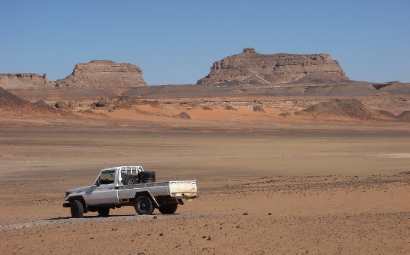 Approximately 4 km further west, amongst the sandstone, siltstone levels appear in which it is sometimes possible to observe frequent and notably developed Arthrophycus (Harlania) sp. The same Situation is to be found, well exposed in a relief, 2 800 km long in a N-S direction and located 20 km WNW of Jabal Qardah. At the base, in the southern zone of the relief, sandstones are present both well-layered or very thick-bedded and pale in colour, which show a marked glacial morphology. On this eroded, "moutonnee" surface, there are deposits of darker, more cemented, medium- and coarse-grained and often cross-bedded, sandstones. More silty levels, soft at the base, sometimes contain abundant, long Arthrophycus. These upper sandstones are more than 40 m thick. In the northern part of this relief, volcanic rocks of a basaltic type have intruded along a NW-SE fracture. Phenomena of contact metamorphism between sandstones and basalt are quite limited. The age of the basaltic intrusions is Oligocene. The whole region W and N of this relief, for a depth of 10-12 km is occupied by hundreds of pinnacles and conical hills of coarse- to fine-grained sandstones; these are generally pale or whitish at the ase, often cross-bedded, more or less cemented and typically oneycomb-shaped from wind erosion. These sandstones underlie the shales of the Tanezzuft Formation and outcrop in a NE-SW alignment (section 10). In the Jabal Asba area the Ordovician is present in various outcrops. The characteristic morphology of very high pinnacles and blades is the result both of a NW-SE System of fractures and of marked wind and glacial-type erosion. Layered sandstones (Mamuniyat Formation) follow, often with parallel laminations, fine- and medium-grained, from buff to violet, with some harder levels rich in ferruginous cement, but generally slightly cemented. In the central western zone of Jabal Asba, the section 4 shows 64 m of Ordovician sandstones. The lower 57 m are represented by thick beds of sandstones, fine- to coarse-grained, generally with parallel lamination. The top of these sandstones shows a morphology characterized by large pinnacles and blades directed NW-SE, rounded peaks and U-shaped valleys. Unconformably, and with a fine conglomerate at the base, approximately 7 m of buff-brown to reddish sandstone follow, medium- to coarse-grained, with clear cross-bedding, which fill all the eroded parts of the underlying formation and are overlain by the shales of the Tanezzuft Formation. These sandstones must be considered as belonging to the Upper Ordovician Mamuniyat Formation. 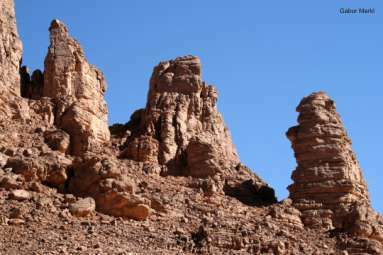 Similar sandstones of the Mamuniyat Formations were found in the NE area of Jabal Asba (section 13). Sometimes there are beds with abundant and large fossil (bioturbations) traces. 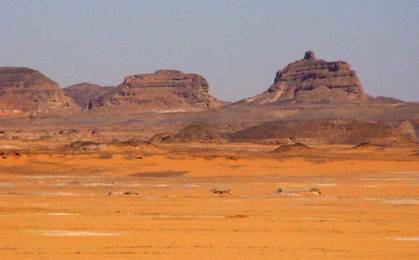 Sandstones of the Mamuniyat Formation were found in the KW2 and KW3 shallow wells below the Tanezzuft shales. Two formations were recognized, Tanezzuft and Akakus, which are typical in the Silurian of the surrounding Palaeozoic basins. The Tanezzuft shales have been described as being up to 130 m thick in outcrops at the basin margins, but the shales were found to be replaced by siltstones and sandstones in two dry exploration wells drilled in the northern part of the basin by AGIP between 1978 and 1981. In the Jabal Asba, the Tanezzuft Formation outcrops over large extensions. In the SW area of this relief, the section 2 has shown 40-50 m of greenish and grey shales, sometimes, on the surface, whitish or purple, very thinly layered, soft, often with coating and dendrites of manganese, and with some interbeddings of greyish, hard micaceous siltstone. Some graptolites of the species Climacograptus medius (TORNQUIST) were found. The Chitinozoa assemblage from 27-33 m consists Ancyrochitina. According to the graptolites the interval from 18-31 m belongs to Lower Llandovery. In core 36-37 m most of the Chitinozoa are absent and the assemblage is dominated by the species Conochitina chydaea JENKINS in association with Rhabdochitina cf. magna EISENACK and Lagenochitina sp. ; these species suggest an Upper Ordovician age (Caradocian-Ashgillian). In the same cores, traces of small Pelecypoda and carbonaceous matter were found. 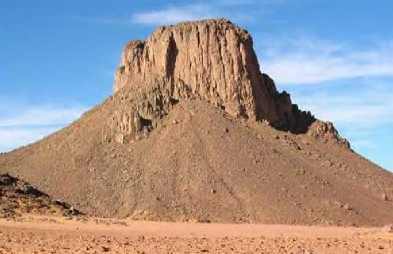 The depositional environment of this formation is open marine and its thickness in the central and northern areas of Jabal Asba is 24 and 18.5 m respectively. At the base, in contact with the sandstones of the Ordovician Mamoniyat Formation, a thin level was observed with abundant traces due, in all probability, to worms. This characteristic level was commonly observed at the Tanezzuft-Mamoniyat boundary. In the area this formation is well characterized from the lithologic and palaeontologic point of view, but it shows very limited thicknesses everywhere. Region of Jabal Qardah (section 10): 25 m of dark grey and grey-green, flaggy siltstone, with thin interbeddings of fine-grained, cemented sandstone and micaceous shales. Rare indeterminable fossil traces were observed on some surfaces. It is thought that the highest part of this formation is eroded, due to the absence of Arthrophycus and Cruziana beds, generally widespread in the whole region, and of the Tadrart sandstones; in this section the Akakus Formation is unconformably overlain by the Middle-Upper Devonian Binem Formation. Southern part of Jabal Asba (section 2): this formation is represented by only 2-5 m of siltstone and fine-grained sandstone, greenish-grey to reddish, with some interbeddings of silty-micaceous shales. In the highest part there is a siltstone bed, hard, yellow and very heavy with characteristic stromatolitic structure. 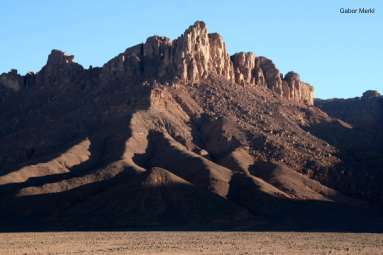 This is a very widespread level in the highest part of the Akakus Formation in this region. There are extremely abundant sedimentary structures (ripple marks, flute casts, etc.) and also fossil traces (Cruziana furcifera, Arthrophycus sp., etc.). The boundary with the underlying Tanezzuft Formation is rather gradual, whilst it is very sharp, marked even with a base conglomerate, with the overlying Tadrart Formation. Central part of Jabal Asba (section 4): 9 m of siltstones and silty-micaceous, multicoloured shales, giving way to fine-grained, cemented sandstones. Abundant sedimentary structures (flute casts, ripple marks, etc. ), bioturbations and fossil remains including numerous Arthrophycus sp. and Cruziana sp. were observed. A similar sequence, 5 m thick, was found in the section 13 both from the lithological-sedimentological and the paleontological point of view. The dominantly continental sandstones of the Lower Devonian, locally with shale interbeddings, have been referred to an undifferentiated complex of the Tadrart Formation; the overlying, dominantly marine, sandstones and shales have been referred to the Binem Formation. 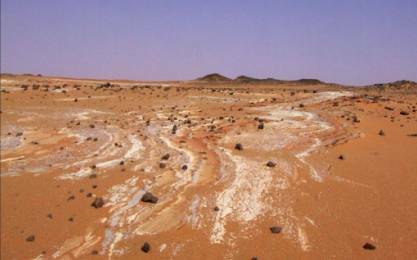 In the southern region, in the Jabal Qardah, this formation may be completely absent, as has been observed (section 10) where the Akakus Formation is directly overlain by the Zoophycus sanstones of the Binem Formation. Differently the northern part. In the section 2 of Jabal Asba: 62 m of light nut-brown to grey-violet, fine to extremely coarse grained sandstones with thin and irregular beds of fine conglomerate; a conglomerate bed is present at the base, at the contact with the Akakus Formation. In general this is a very porous sandstone, slightly cemented and medium to very thick bedded; some thinner levels are of dark, hard ironstone. Sedimentary structures are represented by cross-beddings, foresets, laminations and slumping phenomena. In some cases there are well developed phenomena of overturned cross-bedding or very dipping beds of sandstones and gravels, probably due to fluvial or dune deposits. Central part of Jabal Asba (section 4): 53 m of fine to very coarse grained sandstones, sometimes with irregular beds or lenses of fine conglomerate, with some thin (l 5-20 cm) very irregular interbeddings of siltstones and greenish-greysilty shales. The sandstones are generally very thick bedded and with cross-beddings, overturned cross-beddings, foresets, parallel and cross-laminations, slumpings, etc. In this sequence there are also dark, hard beds with abundant ferruginous cement; one of these beds, 30-40 cm thick, marks the boundary with the overlying Binem Formation. In the section 13 the thickness of the Tadrart is 41 m. The beds of siltstones and silty shales are more numerous and thicker compared with the above-mentioned sections. 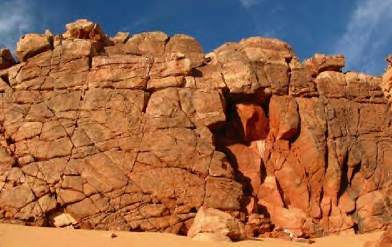 There are thick beds of red and violet-red hard sandstone, with ferruginous cement, such as usually marks the boundary of this formation with the Binem. The Binem Formation has never been formally described and published. The type section is located in the Tibesti area, probably in the area of Wadi Binem-Wadi Ounga. 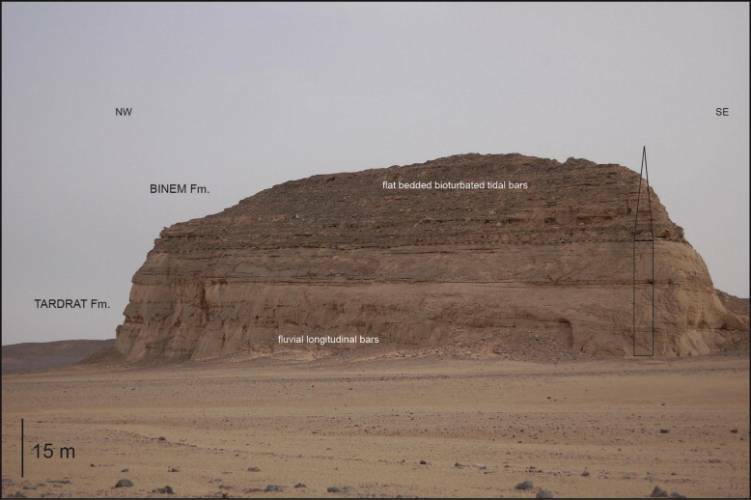 Another suggested reference section in Libya is represented by coordinates 21°52'08"N and 19°44'10"E.
In the Jabal Qardah (section 10), the greatest thickness of Binem Formation was measured (160 m). As already stated for this section the Akakus is unconformably overlain by multicoloured (whitish, pale grey, purple, etc. ), fine-grained sandstones, generally cemented, with some very thin beds of reddish hard siltstone, with ferruginous cement and sometimes with abundant Zoophycus. At the top, the section is formed of sandstones as above, sometimes only slightly cemented, with some interbeddings of siltstone and silty shales and thin beds, or crusts, of hard, red-purple siltstones. Beds with abundant Zoophycus (their size varying from a few cm up to 20 cm) and a few other fossil traces are common. A wide sandy plain separates the top of this formation from the first outcrops of Continental Mesozoic. Another outcrop of Binem sandstones lies 20 km N of Jabal Qardah (section 9); 31 m are exposed but it was not possible to see the lower and upper boundaries of the formation. At Jabal Asba this formation is well exposed and more complete. In the southern part (section 3) a thickness of 35 m was measured, represented by pale grey and purple sandstones, often brownish-red or brick red on the surface, from fine- to medium-grained, well layered, often with cross-beddings, sometimes passing to very slightly cemented siltstone. Rare indeterminable fossil traces were observed. Section 5: 22 m of whitish, pale grey, fine to very fine grained, more or less cemented sandstones with some thin interbeddings of whitish siltstone or very hard reddish clay. Zoophycus of varying size are distributed at various levels throughout the section. Section 4: 45 m of brown-red, reddish, purple and greyish sandstones with grains ranging from medium-fine to coarse, generally well layered, with some harder levels cemented by iron minerals. Section 6: 52 m were measured, 22 m of which are fine, pale grey and purple, well-layered sandstone, with frequent Zoophycus and 30 m are red-brown and buff-brown sandstones, fine- to coarse-grained, often cross-bedded, rarely with fossil traces. In the section 13 the thickness of the Binem is 56 m. The upper part of several sections show thick-bedded sandstones with common vertical, parallel burrows (cf. Tigillites). The sandstone outcropping in the W and NW areas of Jabal Asba is to be added to the Binem Formation. These sandstones are fine-grained, buff, whitish, pale grey, sometimes purple, porous, only slightly cemented. They are often thinly bedded, with common interbeddings of whitish flaggy siltstone. Morphologically they are similar to the sandstones of the upper member and may contain rare fossil remains, including Zoophycus. In the section 7 these sandstones have a thickness of 47 m; of remarkable interest is the presence, at the base of the section, of fine, whitish, crumbly sandstones with very common traces and remains of plants (even longer than l m) at longitude 24°23'38" and latitude 23°15' 25". At the top of the section there are, again, rare Zoophycus sp. and other organic traces. The Binem Formation outcrops NE of southern Jabal Asba show numerous sandstone-siltstone beds with Bifungites fezzanensis DESIO common. 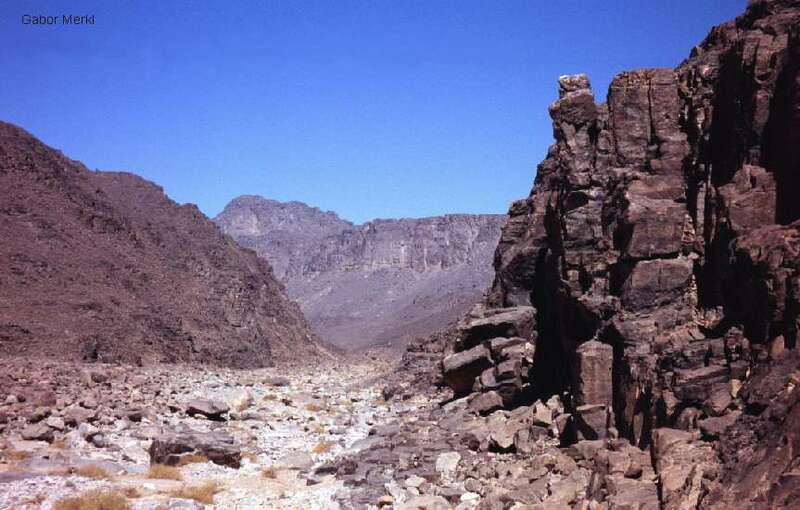 Extremely extended outcrops of the Binem, particularly the Zoophycus sandstones, are located in the most northern area of Jabal Asba and on the SW side of Jabal Rukn. Around Jabal Asba the sediments of the Middle-Upper Devonian are unconformably overlain, towards the W, by continental Mesozoic, while, immediately to the N of lat 23°30' N, they are overlain by sequences of Carboniferous sandstones. 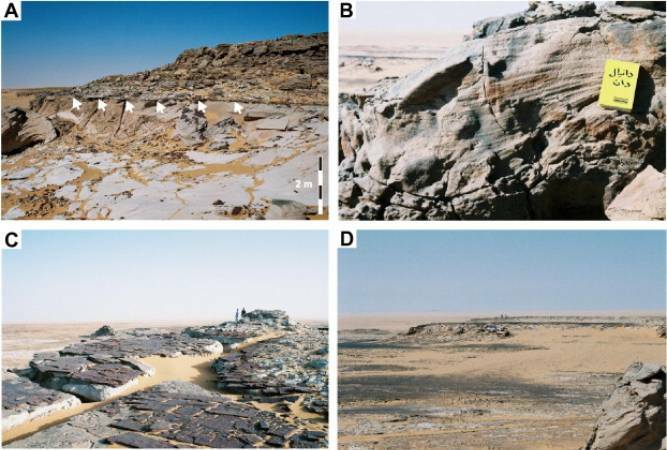 On account of their lithological, sedimentological, palaeontological and environmental characteristics they were referred to the Dalma Formation (from the high hill of Jabal Dalma (Zalmah), NNE of Kufra with coordinates: 25°34'10"N and 23°55'15"E). Two sections were measured and sampled in this formation. The first section 11 shows 95 m of buff-brown, greenish-yellow to grey-purple sandstones, mainly medium and fine grained, sometimes even coarse-grained in the lower third, well-bedded (with common cross-beddings), generally hard and cemented in the higher part, more crumbly in the lower part. In the higher part the sandstones are sometimes very fine grained, thinly bedded and with numerous traces of bioturbations or other indeterminable fossil traces. In the central part of the section, plant remains, including probable roots, have been observed. Further below there are traces and small trunks of plants belonging to the Licopodophyta and again some beds with common traces of "roots". These have been completely replaced by sandstone. About 10 m from the base of the section, large concretions of fine sandstone are common; these are well cemented (sometimes quartzites), long and nearly cylindrical in shape (up to more than 2 m); the size and shape of most of these concretions recall trees completely replaced by sandstone. This characteristic level is to be found for several kilometres in the area W of this place. The section 12 has shown 205 m of Carboniferous sediments; it was made in a group of hills, a synclinal fold, located immediately N of outcrops in the Binem. At the base the outcrops are represented by more than 45 m of fine-grained sandstones, with some thin levels or lenses of conglomerate, generally only slightly cemented on the surface, which form steep and almost inaccessible walls. These are followed by 5 m of whitish-grey, very thinly bedded, quite soft siltstone with numerous plant moulds (Licopodophyta). Subsequently there are fine- and medium-grained sandstones, varying in colour from pale grey to purple, generally only very slightly cemented, thick-bedded in the lower part and subsequently more thinly bedded and with some siltstone beds. There are small irregular beds of conglomerate, cross-beddings, foresets, parallel and cross-laminations. Remains and moulds of plants (Licopodophyta) were observed in the lower part. A further 21 m of fine sandstones and siltstones follow, more or less clayey, thinly bedded and multicoloured with common bioturbations and rare specimens of large Bifungites sp. (5-6 cm in size). The upper part of the section is represented by sandstones, coarse- to fine-grained, sometimes with irregular beds of fine conglomerate, generally only slightly cemented, harder in the higher part, with some levels of clayey and flaggy siltstone. Numerous beds have provided various moulds and remains of plants (Licopodophyta) and of roots; bioturbations occur locally. This sequence is unconformably overlain by the Continental Mesozoic. 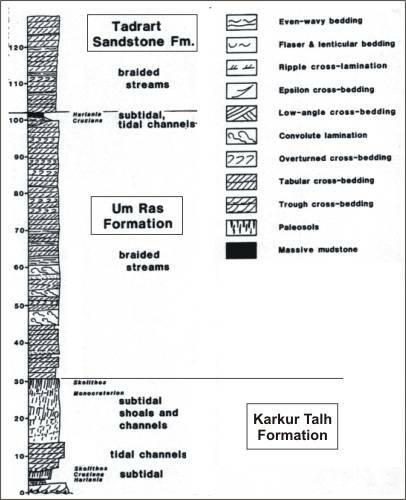 The series of the Karkur Talh and Um Ras Formation were named by KLITZSCH (Geology of Egypt). K-1 22°53'45" 24°24'10" 134 m Mamuniyat (to Tardrat ? ) F. K-7 23°15'25" 24°23'38"
K-2 22°55'25" 24°21'30" 62 m Tadrart F.
40.5 m Tanezzuft F. K-9 22°38'15" 24°23'07"
K-3 22°56'45" 24°18'40" 36 m Binem F. K-10 22°40'23" 24°09'50"
K-4 23°09'13" 24°26'40" 98 m Tadrart/Binem F.
64 m Mamuniyat F. K-11 23°33'50" 24°15'20"
K-5 22°56'25" 24°18'30" 22 m Binem F. K-12 23°45'07" 24°37'30" 250 m Dalma F.
K-6 23°10'30" 24°25'10" 77 m Tadrart/Binem F. K-13 23°11'45" 24°33'48" 97 m Tadrart/Binem F.
"The lower Silurian Tanezzuft Formation in the Kufra Basin consists of shales, which are green, red and light grey at outcrops, and interbedded wavy, rippled or hummocky cross-stratified light grey to reddish-brownish siltstone to fine sandstone beds. Exposures of this soft shale-dominated unit are rare. Inselbergs, as in the Jabal Asba (section M) with exposed shale sections of 29 m, are fortunate exceptions. In most cases, erosion has removed all shales down to a resistant horizon, such as the top Cambro-Ordovician sandstones or fine sandstone interbeds in the upper Tanezzuft succession. Locally in Jabal Asba, the flat floor consits of greenish shales that represent undefined levels of the Tanezzuft Formation. An exeption is section N (Lüning et al.) where the Tanezzuft shales are anomalously thin. Elsewhere, outcrops of the lower part of the Tanezzuft Formation, which are of utmost importance for any source rock evaluation in the Kufra Basin, have not yet been found. It is therefor not surprising that all shale samples collected from the newly measured Tanezzuft sections. The samples originate from the middle and upper parts of the Tanezzuft Formation. 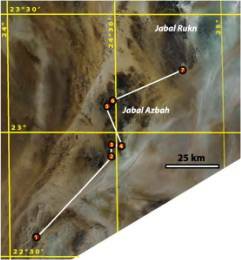 One of the few places in the Kufra Basin where the basal part of the Tanezzuft shales has been accessed is the 60 m deep stratigraphic well KW-2, drilled by AGIP in 1975 in the Jabal Asba arera close to section M (Lüning et al.). The drilling rig was apparently located on top of the exposed Tanezzuft shale horizon that forms a flat shaly wadi floor at ths locality. Cores in the middle of the shale unit at 18-19 m and 30-31 m apparently yielded the graptolite Climacograptus medius (GRIGAGNI et al. 1991) suggest an Llandoverian age. The top Mamoniyat sandstones lie at a depth of 50 metres." AGIP KW-1 22°56'30" 24°18'25" 67 m Binem F.
AGIP KW-2 22°56'50" 24°19'42" 54 m Tanezzuft F.
AGIP KW-3 22°55'20" 24°22'00" 4.5 m Tanezzuft F.
AGIP KW-4 23°06'12" 24°21'20" 66 m Binem F.
M (Lüning) 22°54'15" 24°21'28" 48 m Tanezzuft/Akakus F.
N (Lüning) 23°07'40" 24°26'51" 101 m Mamuniyat to Binem F.
"Detailed outcrop studies at the flanks of the Kufra Basin, reveal the nature of glacially-related sedimentation and post-depositional deformation styles produced in association with the Late Ordovician glaciation, during which ice sheets expanded northward over North Africa to deposit the Mamuniyat Formation. At the SE basin flank (Jabal Asba), the Mamuniyat Formation is sand-dominated, and incises interfingering braidplain and shallow marine deposits of the Hawaz Formation. The glacially-related sediments include intercalations of mud-chip bearing tabular sandstones and intraformational conglomerates, which are interpreted as turbidite and debrite facies respectively. These record aggradation of an extensive sediment wedge in front of a stable former ice margin. An increase in mudstone content northward is accompanied by the occurrence of more evolved turbidites. A widespread surface, bearing streamlined NW–SE striking ridges and grooves, punctuates this succession. The structures on the surface are interpreted to have formed during a regional north-westward ice advance. Above, siltstones bearing Arthrophycus burrows, and Orthocone-bearing sandstones beneath tidal bars testify to glaciomarine conditions for deposition of the underflow deposits beneath. 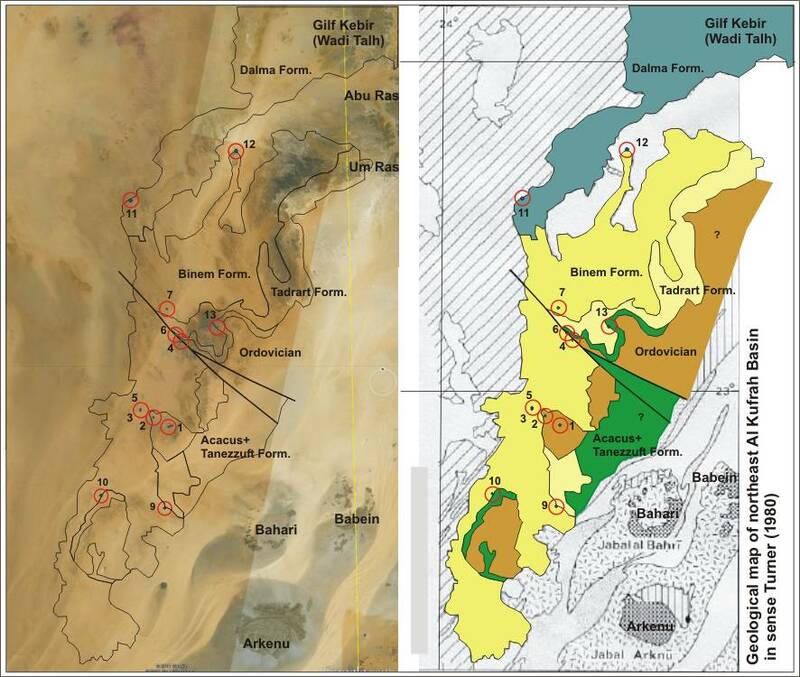 By contrast, the northern basin margin (Jabal Zalmah) is appreciably different in recording shallower water/paralic sedimentation styles and major glaciotectonic deformation features, although facies analysis also reveals northward deepening. Here, a siltstone wedging from 8 to 50 m toward the north was deposited (lower delta plain), succeeded by climbing ripple cross-laminated sandstones up to 60 m in thickness (distal through proximal delta mouth bar deposits) with occasional diamictite interbeds. These rocks are deformed by thrusts and > 50 m amplitude fault-propagation folds, the deformation locally sealed by a diamictite then overlain by conglomeratic lag during ultimate deglaciation. Integrating observations from both basin margins, a model of fluvial-dominated delta systems feeding a pulsed debrite and turbidite fan system in a shallow proglacial shelf is proposed." A: Planar cross-bedding developed within coarse-grained sandstone, with granule-lined foresets. B: A single set of planar cross-strata, developed within a granular conglomerate. These structures are sandwiched between laminated, fine- to medium-grained sandstones. C: Abundant orthocones, with test chambers partially disarticulated, within medium-grained sandstone. These fauna, along with broken brachiopod tests within the same deposit, are the only examples of body fossils found by the authors in the Lower Palaeozoic of Jabal Asba. D: A sub-horizontal, manganese-encrusted tubular burrow within coarse-grained sandstone. E: Planolites (surface trails) at the top of the Mamuniyat Formation. A: These deposits dominate the lower part of the Mamuniyat Formation of Jabal Asba, and comprising a wedge of poorly to thickly bedded massive or mega-rippled sandstone. B: Thickly bedded, mega-rippled sandstone facies, interpreted as the products of sustained flows, potentially under glacial outburst flood conditions. C: These sandstones are punctuated at several intervals by matrix-supported sandy conglomerates that may show a channelised basal contact. D: Typical occurrence of the matrix-supported conglomerate with abundant mud-clasts within a matrix of sandstone. E: Current rippled sandstone facies, resting sharply upon a clast-bearing, thickly bedded to parallel laminated sandstone facies. F: Flame structures within deformed siltstone facies. A: General view of the Lower Palaeozoic stratigraphy of Jabal Asba showing 1) a well-developed disconformity at the base of the Tannezuft Formation and 2) the undulose nature of the intra-Mamuniyat unconformity a few metres beneath it. Below this latter unconformity, the thickly bedded sandstone facies association is preserved; above it occurs the cross-bedded sandstone facies association. C: The relief of the structures (> 1 m). D: Metre-deep groove along the unconformity showing striations that are strike-parallel to the trend of the grooves. E: Microfaults, with a normal sense of displacement and throws of 15 cm, traversing a groove on the unconformity surface. 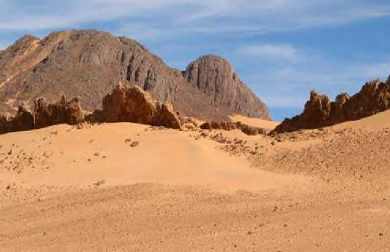 "Fieldwork at the flanks of Al Kufrah Basin, Libya, reveals that Late Ordovician ice sheets were present in the eastern Sahara and that they extended northeastward toward Egypt. 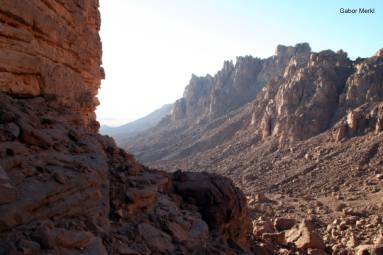 Evidence for grounded ice sheets is preserved at the both the southeastern (Jabal Asba) and northern (Jabal Zalmah) basin margins. Characteristic soft-sediment deformation structures, including soft-sediment folds, small-scale faults and striated pavements indicate subglacial shearing and the formation of glacial erosion surfaces. 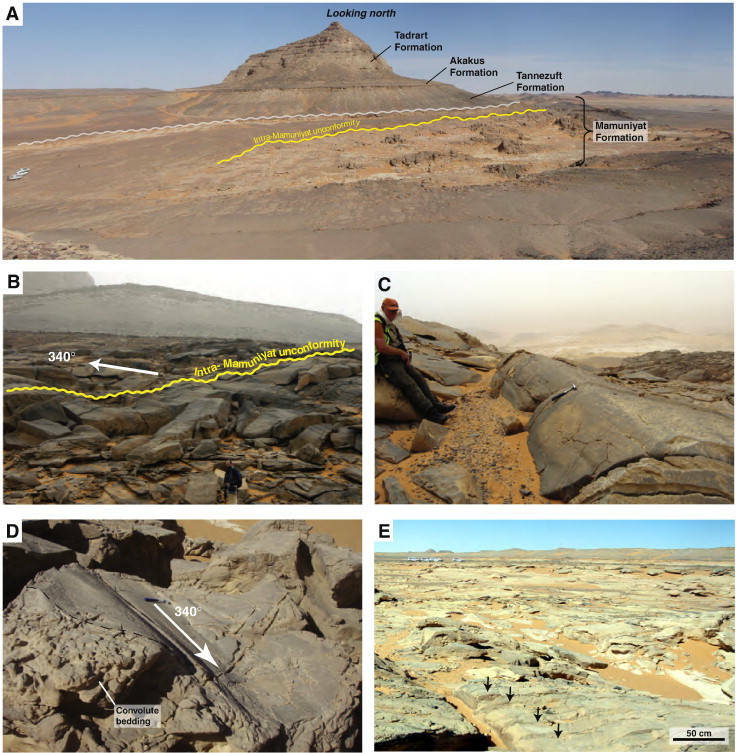 These findings support the presence of a Late Ordovician ice margin in the eastern Sahara and add vital new constraints to reconstructions of the morphology of North African grounded ice sheets. Prior to our study, there existed two plausible models on ice sheet geometry. The first was that separate ice sheets - namely a north and west African ice sheet and an Arabian ice sheet - extended over this part of western North Gondwana. The second was that ice cover was continuous. The presence of a suite of subglacially-generated deformation structures adds considerable credence to the latter interpretation." A: General view of sediment-striated surface (arrowed) separating parallel-laminated sandstones beneath from megaripple-bearing sands above. B: Megaripple above the striated surface shown in A. C: Ferruginous patina/crust, characteristic of the soft-sediment-striated surface. D: Regionally planar character of striated surfaces is typical in Jabal Asba. 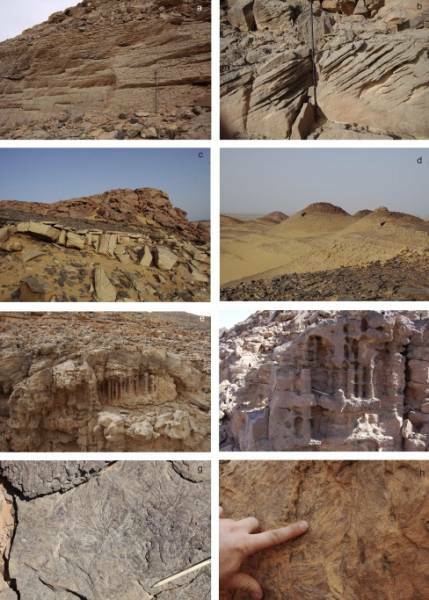 E-G: Photographs of the same striated surface taken from different perspectives, showing mm-scale ridges and grooves characteristic of identical surfaces elsewhere in North Africa. Photographs taken between 25°51.945′N - 24°24.056′E and 22°51.752′N - 24°24.095′E. 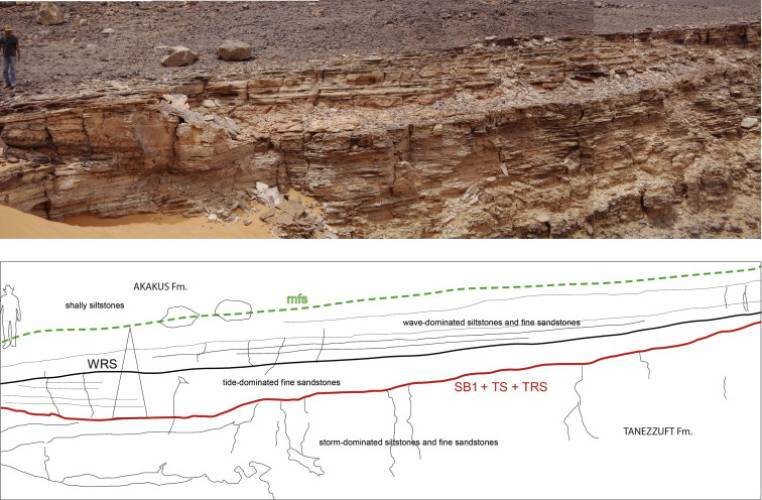 "New fieldwork data collected from the flanks of Al Kufrah basin, SE Libya, provide insight into the controls on Siluro-Devonian sedimentation patterns along the eastern part of the North Gondwanan platform. 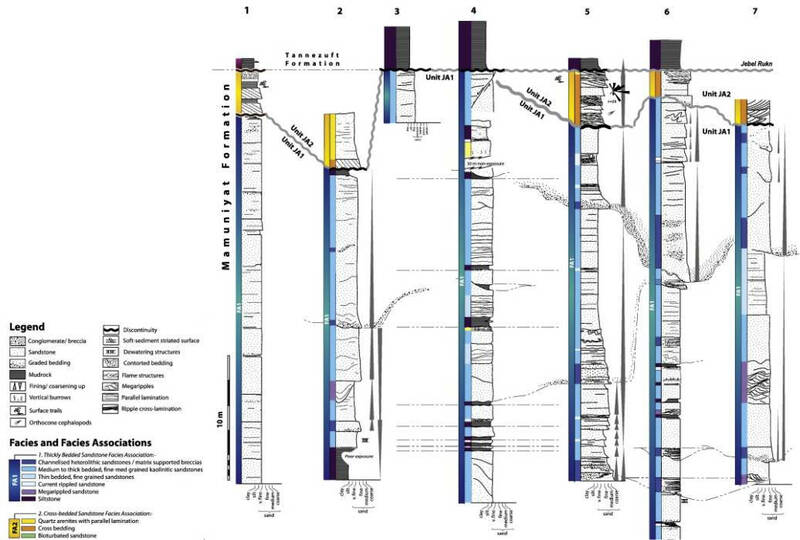 A stratigraphic and sequential correlation framework from the northern and eastern flanks of the basin is presented for the Tanezzuft, Akakus, Tadrart and Binem formations. Ten facies associations are recognised, classified within three process-driven groups, facilitating high-resolution sequence analysis and highlighting key regional unconformities. The basal, shaly Tanezzuft formation is organised into a regional transgressive cycle that overlies upper Ordovician glacially-related deposits of the Mamuniyat formation. The shale grade upward into the heterogeneous Akakus formation that comprises complex deltaic thin sandy strata interbedded with silty shale and siltstones, widely influenced by storm to tide related flows. 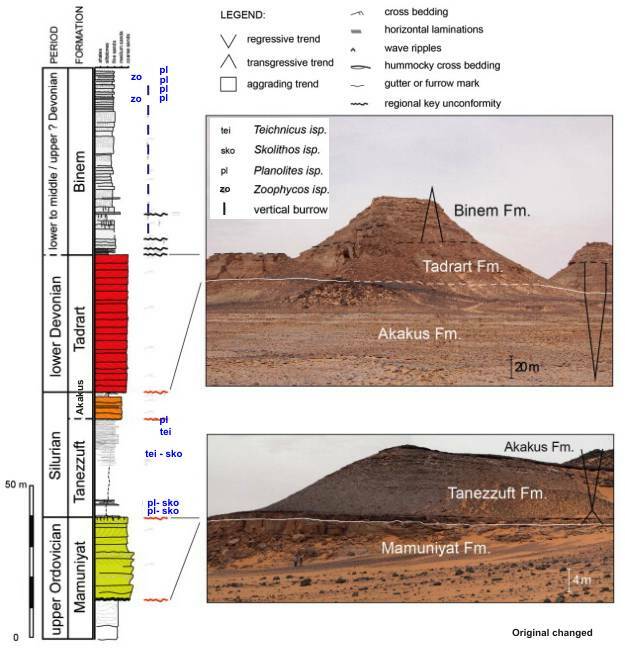 In Jabal Zalmah (northern flank), four 3rd order transgressive–regressive (T/R) depositional sequences were identified, whilst only one in Jabal Asba (eastern flank), indicating significant erosion of the Akakus due to the Caledonian deformation. Depositional cycles are made of sheltered tidal flat deposits which pass upward into lower to upper offshore heterolithic deposits. They are bounded by regional disconformities interpreted as forced regression surfaces. The Silurian Tanezzuft and Akakus formations form together an overall 2nd order regressive succession. 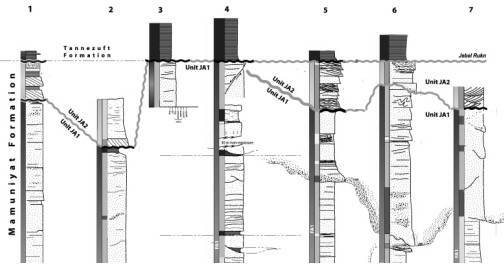 The Caledonian unconformity is interpreted as a mega-regional sequence boundary resulting from uplift and erosion during the late Silurian into the early Devonian. 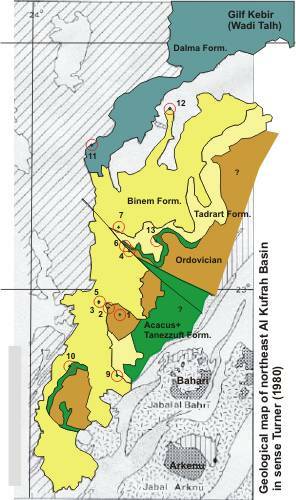 The thickness variability of the Akakus formation across Al Kufrah basin is strongly indicative of differential erosion which generated a complex basin physiography. Above, the Tadrart formation of lower Devonian age forms an aggrading braided-style fluvial sandy sequence of approximately constant thickness across the basin. A return to marine conditions by the mid to late Devonian resulted in deposition of the Binem formation as a series of three stacked 3rd order T/R cycles. These deposits comprise bioturbated, tide-dominated successions which preserve some evidence for periodic open marine flooding. 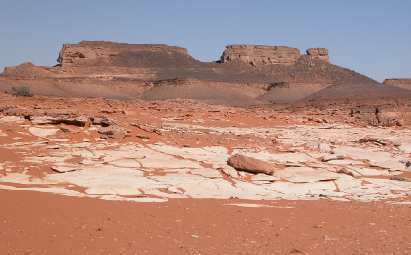 Lying conformably on the Tadrart formation, the Binem formation forms an overall 2nd-order transgressive trend where a maximum flooding surface occurs within the uppermost bioturbated deposits. Stratigraphic correlations made on Siluro-Devonian deposits reveal a complex sequential organisation and also account for the impact of the Caledonian erosion on pre-tectonic strata. 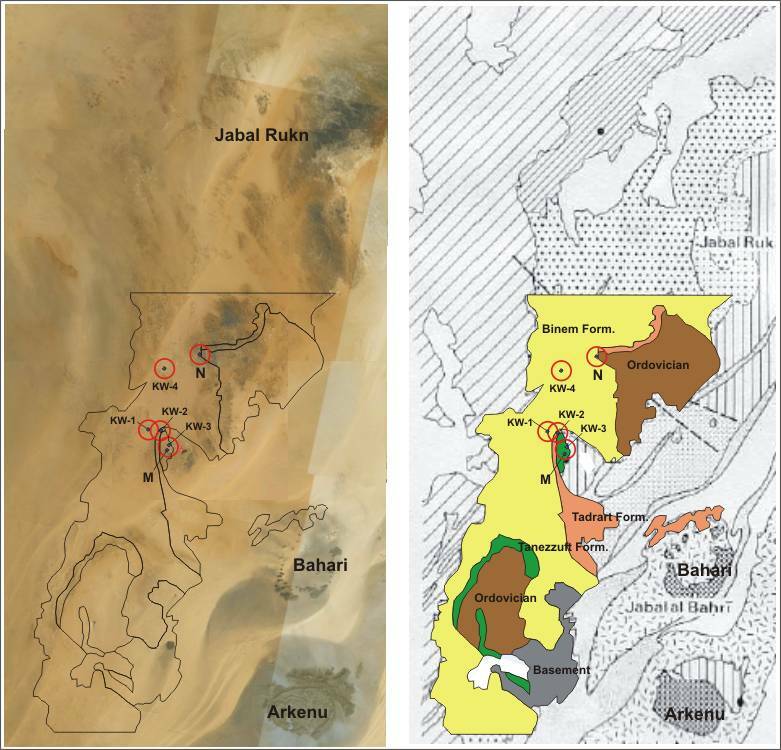 Post-Caledonian Devonian deposits develop on a smoothed topography associated with a regional uplift and can be easily correlated over the Al Kufrah basin." 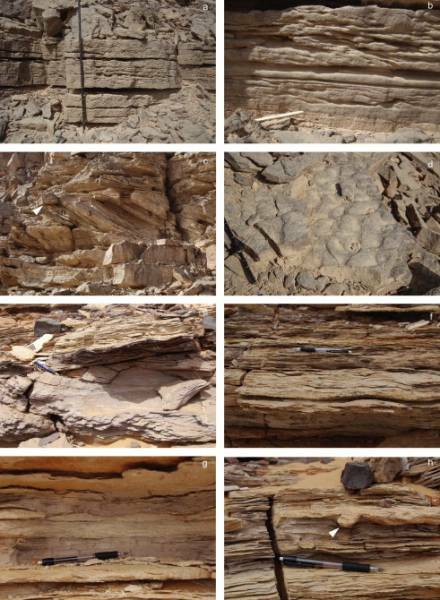 (a) Amalgamated hummock cross-stratified fine-grained sandstones forming massive sharp-based equivalent shoreface deposits (Jabal Zalmah). (b) Amalgamation of symetrical vortex straight-crested oscillatory ripples in fine to medium grained sandstones (Jabal Asba). (c) Interferent polygonal co-genetic ripples or “bricks and tiles” pattern-like ripples (Jabal Zalmah). (d) Stacked assymetrical climbing ripples sets forming centimetric thick tabular sandy beds. Facies may include “ball and pillow” structures (Jabal Asba). (e) Details of an aggrading pattern of in-phase symmetrical climbing ripples within well-sorted fine sandstones (Jabal Asba). (f) Teichnicus sp. burrowing a thin wave-rippled sandy bed (Jabal Asba). (g) Tabular millimetric-thick silty sandy benches interbedded with muddy siltstones (distal upper offshore). 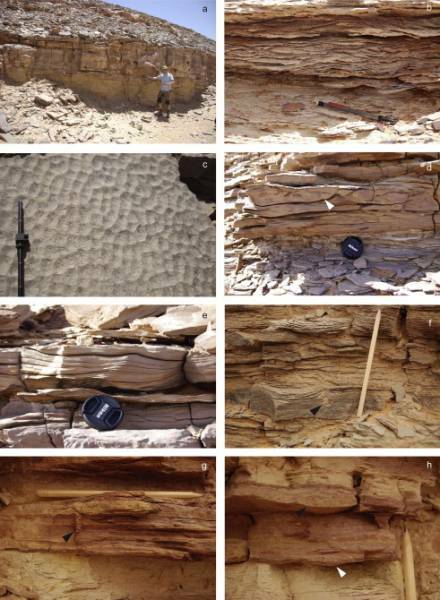 (h) Details of undulated fining-upward storm graded sandy and silty layers burrowed by Skolithos sp. (distal upper offshore). (a) Highly bioturbated horizontal and tabular decimetric thick sandy sheets (Jabal Zalmah). (b) Bioturbated cross-bedded fine-grained sandstones with planar foresets of megaripples (Jabal Zalmah). (c) Lee side face tangential foresets of migrating megaripples scoured at the top by erosive surface (Jabal Zalmah). (d) Close-up of lingoid crested unidirectional current ripples train (Jabal Zalmah). (e) Concave-up scour surface truncating a stoss-side megaripple, underlain by wave-generated ripples (Jabal Asba). (f) Aggrading in-phase symmetrical climbing wave-generated ripples into a fine to medium – grained sandy bench (Jabal Asba). (g) Lenticular to wavy bedding in a muddy to fine-grained sandstone assemblage (Jabal Asba). (h) Small asymetrical gutter cast located at the base of a centimetric thick coarse – to medium – grained cross bedded sandy bed (Jabal Asba). (a) Massive reddish fluvial cross bedded sandstones of the Tadrart formation (Jabal Asba). 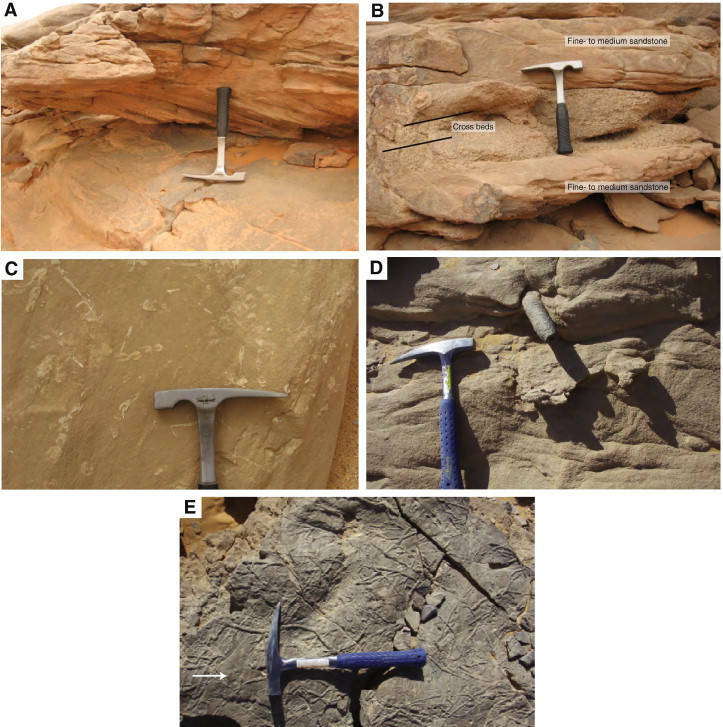 (b) Details of planar cross-stratified fine-grained sandstones (fluvial bar preserved in the Tadrart formation) (Jabal Zalmah). 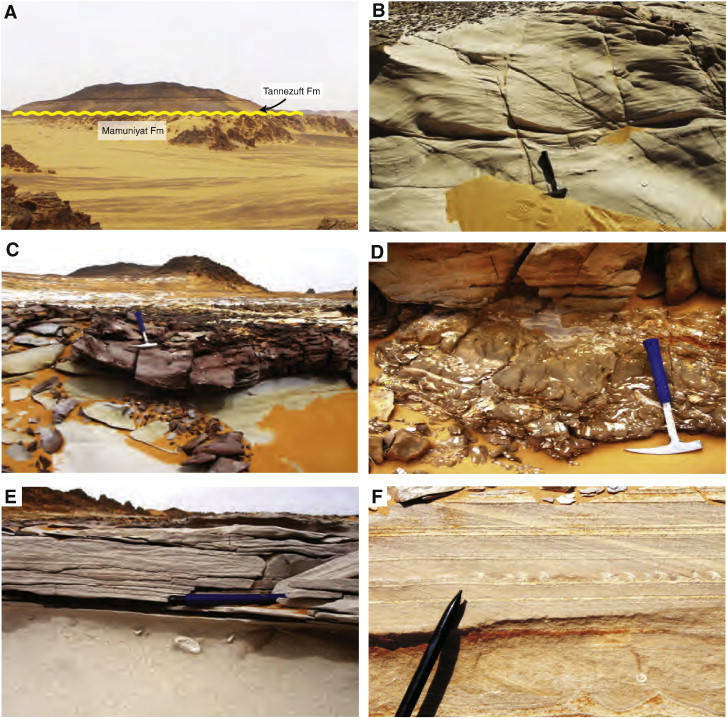 (c) Heretogeneous hummocky cross-stratified succession of the Akakus formation truncated by reddish cross bedded fluvial Tadrart formation sandstones (Jabal Zalmah). 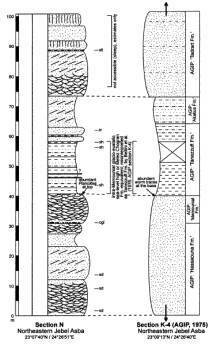 (d) Illustration of the top Silurian–base Devonian unconformity at the Akakus–Tadrart formations transition (Jabal Zalmah). (e) Cross-bedded sandstones of the middle Devonian Binem formation significantly affected by numerous Skolithos sp. burrows (Jabal Asba). (f) Close-up of a “Tigillites” facies in the Binem formation (vertical burrowing of long Skolithos ichnofabric) (Jabal Asba). (g) Zoophycos sp. significantly preserved into the uppermost Binem formation (Jabal Asba). (h) Spirophyton isp. preserved into the uppermost part of the Binem formation (Jabal Asba).